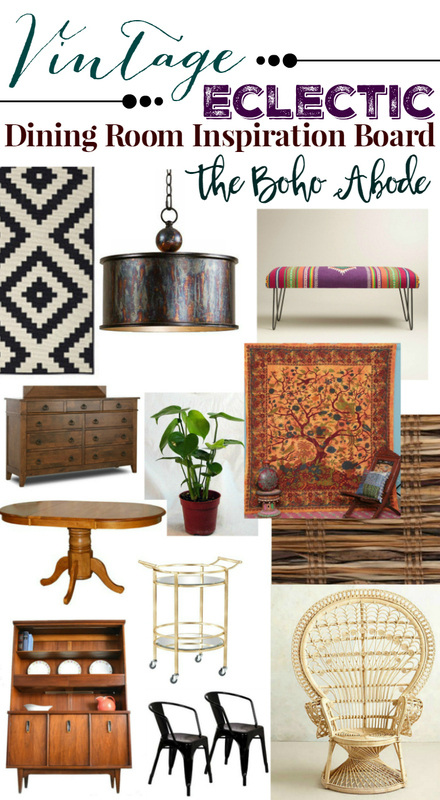 I'm still avoiding the bathroom remodel and dreaming of other spaces so I put together a mood board for the space I want to set my sights on next- the dining room. 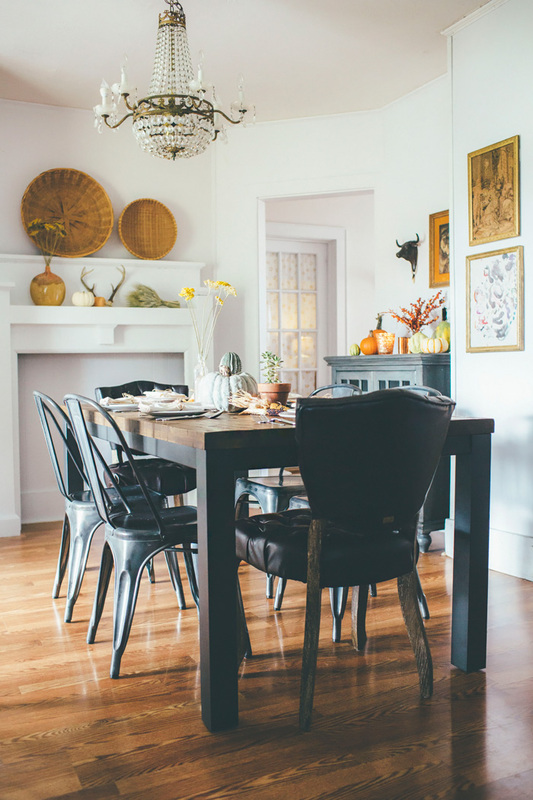 The basics of great dining room design is simple, but looking into the function of the space and playing around with all of the different furniture options we have now gets a little daunting. Overall, I have a general idea of what I want the space to look and feel like. I have most of the furniture but the walls need to be painted. I have little trinkets and window treatments. But, I also have a pile of junk that I need to figure out what to do with. An ugly old light fixture that needs replacing. And a lot of painting to do. I'll consider sharing pictures of all that chaos later, for today- it's pretty spaces and a mood board. I'm inspired by eclectic dining rooms. With a lot of neutral pieces and pops of rich jewel toned color. 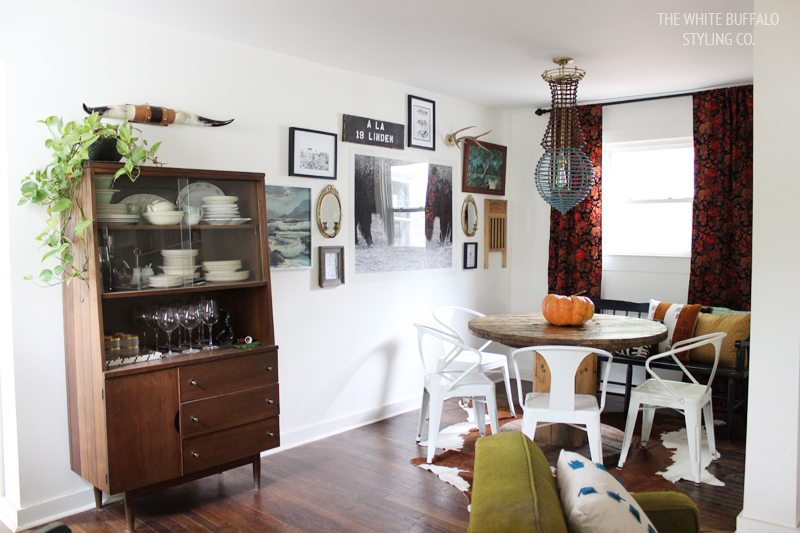 This dining room from Lindsay of The Buffalo Styling Co. has inspired me for ages now. That light fixture has haunted my design dreams since the first time I saw it. But there's other pieces, too, that I'm inspired by. Like the subtle, yet still fresh and vibrant, curtains. The rustic vibe of the table paired with the clean lines of the mid century china cabinet is so interesting. And the fact that the space isn't huge is a big thing for me. It can be so overwhelming looking at giant spaces full of all the bells and whistles when that just isn't relatable to my space at all. There's a similar trend with many of the dining rooms that serve as inspiration for the space I hope to have. 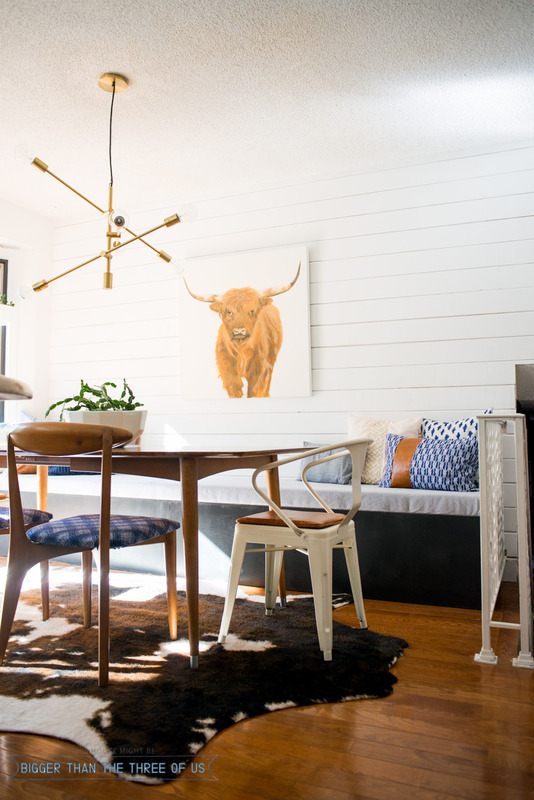 This space from Ashley of Bigger Than The Three Of Us also has a fresh and bright vibe. Eclectic, again, is the theme of the space. The mid century dining set is to die for. She also used an interesting light fixture, different style but still so cool and different. Those same style chairs pop up again and it's a mixed seating situation in both spaces. Hm.. and now that I think of it, anyone else seeing double with the cowhide rugs? Ha, I'm kind of predictable, eh? One other space that I've swooned for pretty majorly is Thought's From Alice's dining room. Striking lighting never fails to enter the dining room of my dreams. Her space isn't so heavy of the jewel tones like Lindsay's is, but I love that they both have a rustic feel to them. The pretty coordinating artwork have warmer tones that I adore. And look, more of those cafe style chairs. Every one of these spaces are stunning. It's crazy how beautiful they are, but they still look comfortable and easy to be in. That's exactly the feeling I want in my space. I hope you enjoy the inspiration I've shared and that you'll join me on the journey of creating a vintage bohemian dining room in my own home. Oh my, thanks for including my room as inspiration. I love your design board!! The cowhide - we love it and it's super durable. I got ours from Overstock and it's fake. It vacuums great and hides dirt. I can't wait to see what happens in your space. Beautiful ideas, I love that bench!! Nice rooms! I especially love the last one. That chandy is amazing. These are gorgeous rooms. I love your mood board as well! I'm loving that colorful bench on your room board. You have a beautiful vision for your dining room! I also loved Ashley's dining room when I saw it, so it was great to see it again here. Good luck - I can't wait to see the space!! These are all great rooms. I love the chandelier in the last pic---each room has eclectic mixes that i like! Gorgeous inspiration rooms and I can't wait to see the new dining room!!!! Loooooove those vintage chandy's and love your moodboard. I have dining room makeover dreams too sweet friend. We have a dining room makeover in the works as well, but I'm still working on the design plan. Love your mood board! Vintage eclectic = swoon!